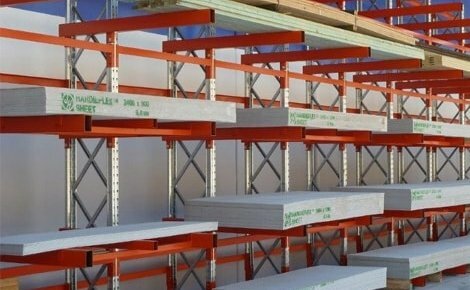 Push back racking is a pallet racking system that can be anywhere from 2 to 10 pallets deep. Push back racking uses a moving cart system where pallets sit on carriages. Pallets are loaded and removed from the front of the system relying on the force of gravity to roll the remaining pallets forward each time the front pallet is removed. This makes stored products easily accessible as the pallets will always move to the front of the system until the entire track is empty. 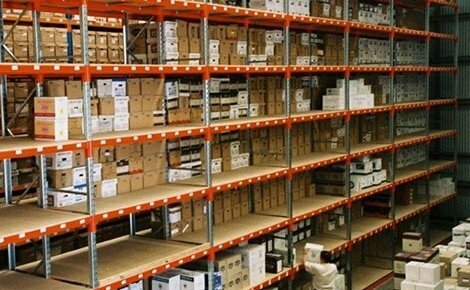 Push back racking is ideal for the storage of multiple pallets of the same product as only the front pallet of each location is accessible from the aisle. 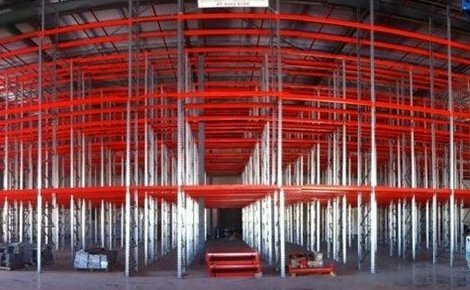 However, this type of racking allows for a much higher differentiation in products than comparable drive in racking systems. This is because each track is independently loaded and unloaded allowing for different products to be stored in each location, both horizontally and vertically. 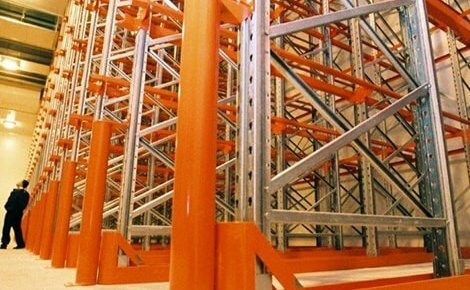 Push back pallet racking is a last in, first out (LIFO) system meaning that it is not suitable for the storage of perishable products. 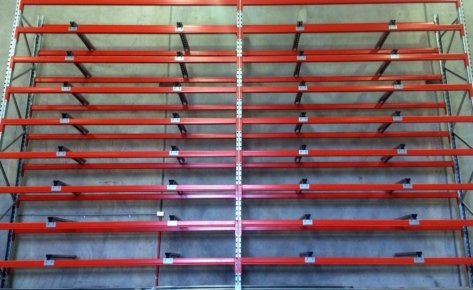 In a push back racking system, each track has a pair of inclined rails. Pallets are loaded and unloaded from carriages that sit on the rails. Because the rails are inclined, each time a pallet is removed the force of gravity pushes the remaining pallets forward. Each track in a push back system has one less carriage than pallet storage spaces. So in a push back racking system that is 5 pallets deep, there are 4 carriages to house pallets with the fifth pallet being loaded straight onto the rail. This way, when the front pallet is removed, there is room for the remaining pallets to slide to the front of the system. 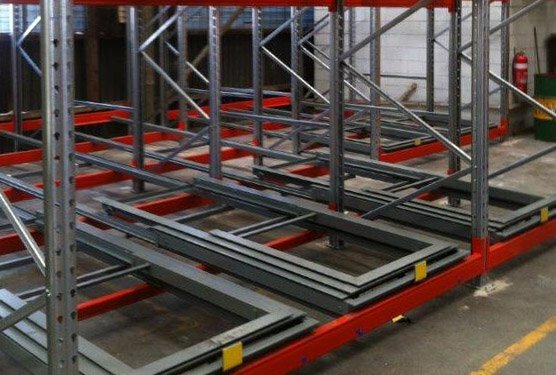 Because each time a pallet is removed from the system a new pallet moves to the front of the track, push back racking can be loaded and unloaded using a standard counterbalance forklift rather than equipment with further reach such as a reach fork truck. 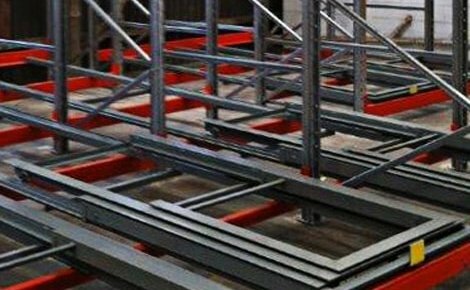 Push back pallet racking is designed so that each time a pallet is removed, the pallets behind it automatically slide to the front of the racking system. 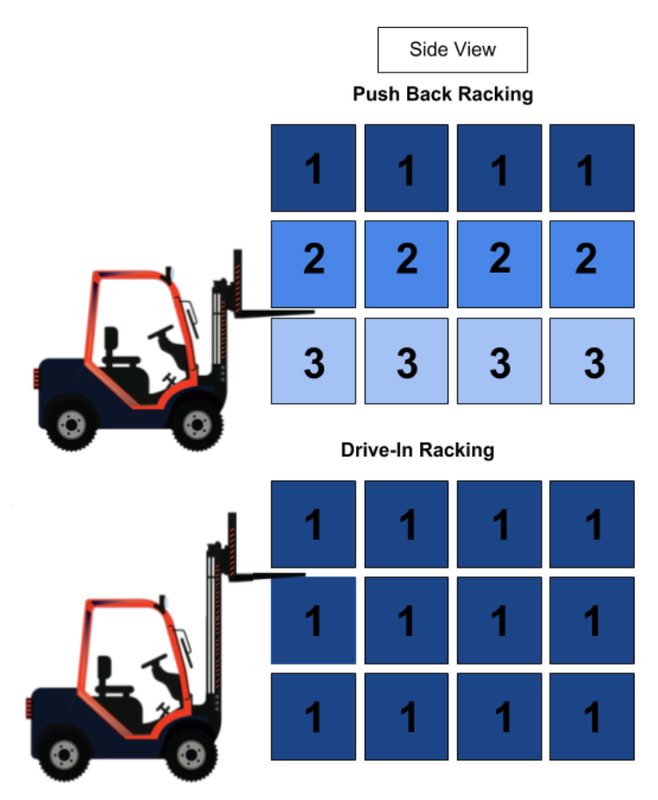 This makes it easier for the forklift operator to remove the next pallet without the need for forklift attachments or having to switch to the specialised equipment that is required for similar high density systems, such as double deep racking. This also makes push back racking faster to load and unload than drive in racking as each pallet is loaded from the front and automatically moves forward as pallets are unloaded. 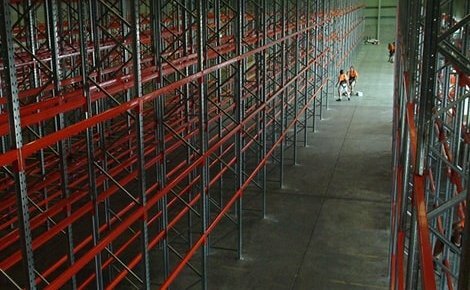 Push back pallet racking can be used to increase storage capacity in a warehouse without increasing the number of aisles. 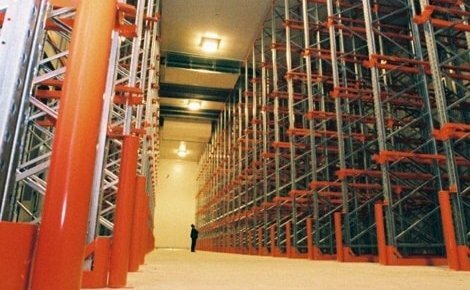 This is because push back racking can be up to five pallets deep per system. 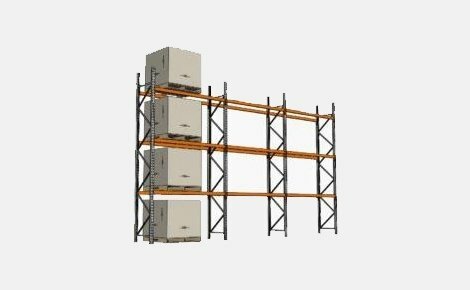 Additionally, racks can be placed back to back to store a maximum of ten pallets between aisles. 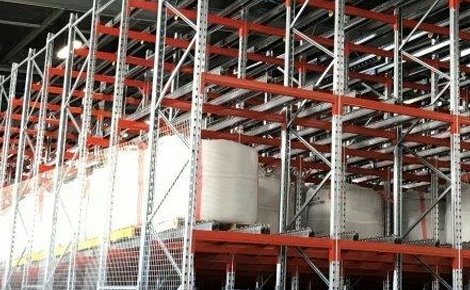 This means that a push back racking system can increase storage capacity by up to 60% when compared with a double deep racking system configuration with the same number of aisles. 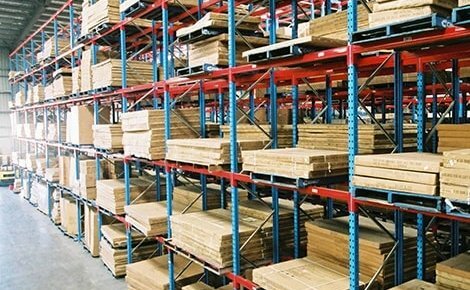 Push back pallet racking is a high density pallet racking system that can be used for product ranges of low to moderate differentiation. 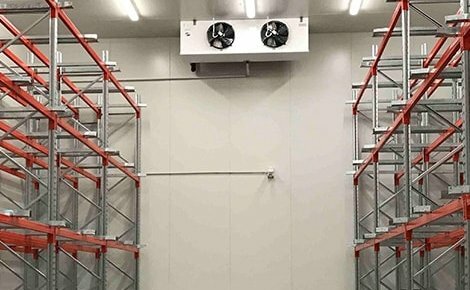 In a multi-level push back racking system, each track is individually accessible allowing for the storage of different products in each location. 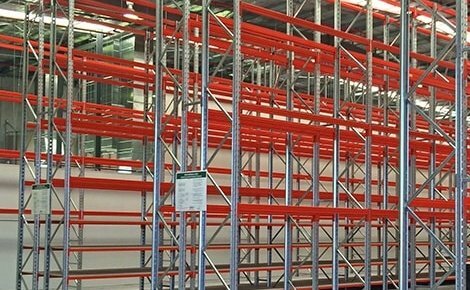 This gives push back racking a higher accessibility than comparable high density systems such as drive in racking. 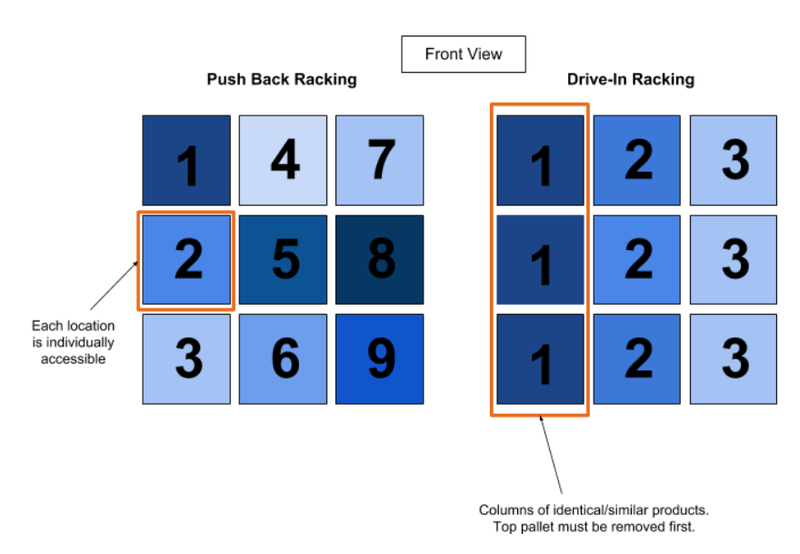 This is because a drive in racking system requires pallets to be removed in order from top to bottom meaning identical or similar pallets must be stored in columns. (See image 1 below). 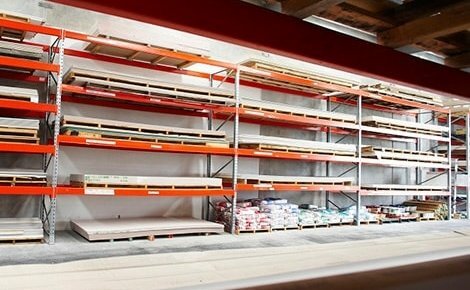 For example, in a push back racking system that is three pallets high, four pallets deep and three pallets wide, nine pallets are immediately accessible from the front of the aisle which means you can store nine product types in the system without reducing accessibility. Conversely, in a drive in racking system, you must remove the pallet at the top of the stack to access the pallets below. 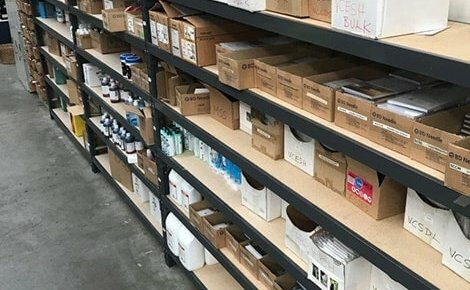 So in a drive-in system of the same configuration, only three pallets are immediately accessible from the front of aisle meaning that you can store a maximum of only three product types without affecting product accessibility. (See images 1 and 2 below). 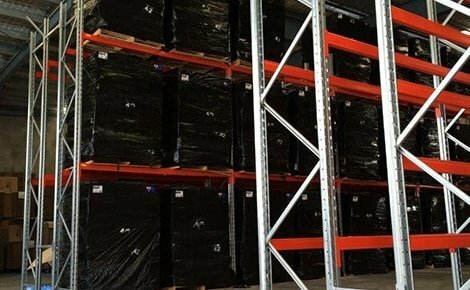 Another benefit of push back racking is that, unlike other high density storage systems, it does not require a specialised forklift with extra reach. 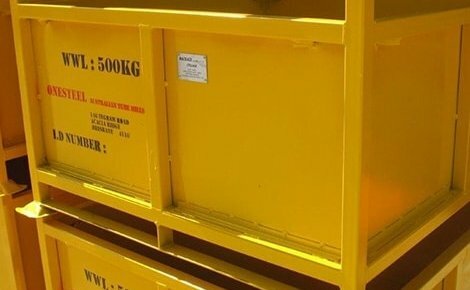 This is because the inclined rails of a push back racking system means that each time a pallet is removed, the next pallet slides forward into the front position which is accessible by a standard forklift. This means that push back racking affords you the benefits of a high density storage systems without requiring a new specialised forklift or long reach attachment, saving you money. The carriages on a push back racking system can be 2-10 pallets deep, and you can have as many across as you like. You can also request your system to incorporate multiple levels. 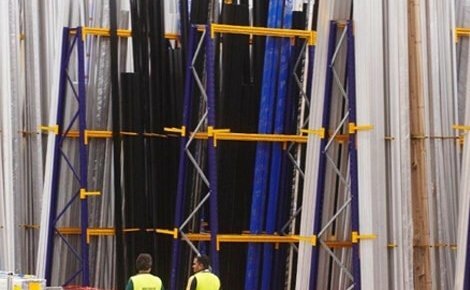 No matter how high, wide or deep your ideal racking system would be, we can tailor the perfect solution for you. At its core, this is a system designed for warehouses with a large amount of similar product. 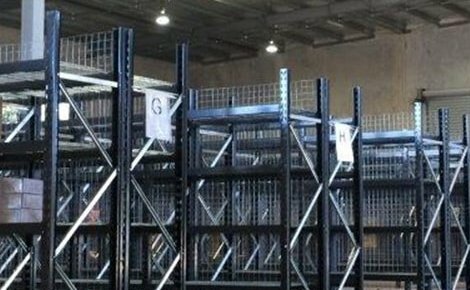 The most effective and logical way to benefit from push back racking is to store identical or similar items in each carriage system/location. 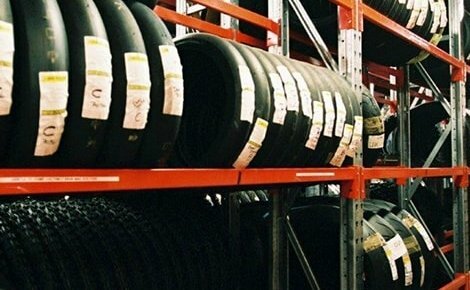 This simplifies stock locations, preventing products from getting mixed up or lost. 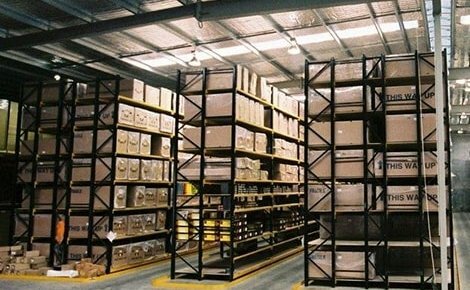 If you need LIFO racking call MACRACK on 1800 048 821 for a chat. 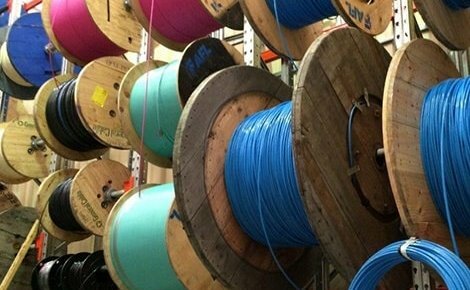 We can run through the pros and cons of each system and work with you to decide what would suit you and your warehouse best. 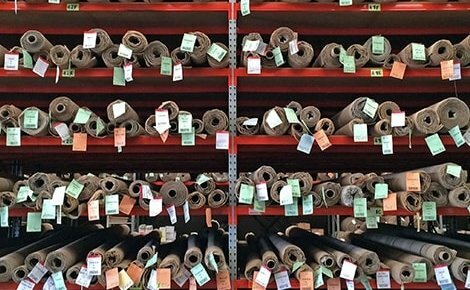 We might even help you realise that the perfect storage solution for your business is one you’ve never thought of! Contact us today to get started.